Trucking often runs in the blood. The hours spent at the wheel, gnawing away at the miles of asphalt and chasing the horizon seem to burn themselves into the family line. Fathers pass their trade to sons and daughters, who, in turn, keep the wheels turning. For Doug Prall, this was very much the case. Today, Doug is the owner of HDS Companies (Doug’s Trade Name), which includes: Digby Southwest, 160 OTR Trucks leased to Swift Transportation (1989); HDS Safety Services (1989); Highway Diesel Services, a private & public maintenance shop (1991); and four truck driving schools in Tucson, AZ (1991), Phoenix, AZ (2009), Yuma, AZ (2010) and El Paso, TX (2017), these four schools send 90 newly trained drivers out into a thriving industry each month, setting their lives, and often that of their families, on an upward curve. After a series of ups and downs, Doug managed to rescue the family business, as well as paving his own path. 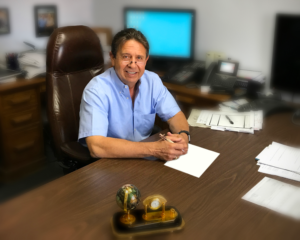 By the time he teamed up with Don Digby Senior in 1989 to form Digby Southwest, he was also running a successful Warehouse/Distribution Center and successful brokerage service of his own. The early entry into the business world clearly had its benefits. Doug started the HDS Truck Driving Institute in 1991, which catered to the changes that the industry was going through. A few years prior to this, the government had sought to improve road safety and had tightened regulations on truck drivers, who now required a Class A CDL license. As a result, there was a drought in drivers and a desperate need for a driving school to equip new entrants into the industry with the qualifications they needed to work. HDS quickly grew. In 1995 Doug became 100% owner of Digby Southwest, and in 1996 with the help of Jerry Moyes, Doug moved his fleet to Swift, creating a relationship that is now over 20 years old. A great deal of the success in building the business, Doug feels, is that HDS promotes a close, family-like feel for those who work under their guidance. The community and quality business relationships are vital to the company’s success. Despite now employing around 275 people made up of a fleet management team, truck driving school instructors, a DOT safety consulting staff, mechanics and a management team, the supportive company culture has been fostered and continues to be felt in the workplace. Doug’s desire to ensure that HDS remains a company where people looked forward going into work every day has been recognized by those outside of the business, and the trucking industry in general. In 2015, HDS was awarded the Tucson Metropolitan Chamber of Commerce Copper Cactus Award for the Best Place to Work in Tucson. In Arizona today, trucking companies are once again crying out for drivers. A gap is there that needs to be plugged and for those individuals willing to plug it, there is the guarantee of reliable work and an exciting future. The trucking industry relies on companies like HDS to train drivers who will continue to clock up miles and keep the gears of business greased. The future looks bright for HDS Companies, and as always, Doug Prall is looking forward. The wheels keep turning at HDS as Doug’s son, Wayne, has recently come aboard. Having spent 6 years working in the trucking industry outside of the family business, Wayne is learning to take the reins. The journey from fledgling minnow to bulwark of the Arizona trucking industry speaks of the quality of service and the hours of hard work that Doug and the team have put into the business. He is very aware of the role his family, friends, and employees have put into its growth and is proud to have continued a business that his father started. “We represent the true entrepreneurial spirit of a local small business that nurtured progressive growth, weathered the storm of multiple economic cycles, and emerged in Arizona as an industry leader,” he said. previous post: Featured Member: Precision Heavy Haul, Inc.